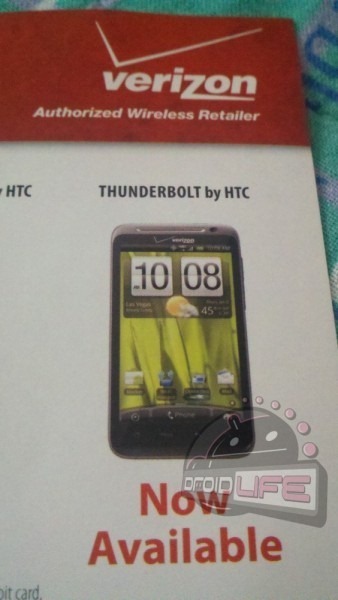 Oops - Authorized Verizon Retailer Sends Flyer To Customers Claiming HTC Thunderbolt Is "Now Available"
Way to pour salt on your customers' wounds there, Verizon authorized Verizon retailer: pictures have surfaced of a new flyer arriving in customers' homes (obtained by Droid Life) that shows the HTC Thunderbolt with the words "Now Available" beneath it. No, this isn't an unexpected dream come true for Verizon customers, it seems like a flub by an authorized dealer (it's unclear to us which one) that certainly can't help calm the restless natives. Despite the rhetorical wrangling we heard from a Verizon exec yesterday about being on track with LTE phones, this flyer appears to confirm beyond the shadow of a doubt that Verizon had originally intended for its first LTE smartphone to be available much earlier than that. Rumors of atrocious battery life are thought by many to be the reason for the lengthy delay of the phone, which Best Buy began taking pre-orders for last month. This leaves us to wonder which trigger-happy retailer pulled the heartless joke and, more importantly, why. Update: Dave in the comments suggests that the photo is Photoshopped, or is at least waiting for the real launch day in Best Buy's back rooms. Unfortunately, we have no way of reliably verifying either of these theories at the moment, but they do sound plausible.